With the cold weather and holidays, we have been indulging in fairly heavy and (fat) rich meals, so we decided to have a light dinner last week and decided to have diced chicken wrapped in lettuce. The problem was, I was out of hoisin sauce. So, we improvised a bit this time, and made our own sauce. I still prefer the hoisin sauce though. Mixture of 1 tsp. oyster sauce, 2 tablespoons bottled barbeque sauce, 1/4 cup Catalina dressing, 1-2 tablespoons of ketchup, 2 teaspoons honey, and salt and pepper to taste. Mix together the cornstarch, dry sherry, oyster sauce, and water in a small bowl. In a wok or large pan, heat oil and saute’ the chicken until opaque and set aside. Heat up a bit more oil and saute’ the ginger, garlic and onions until fragrant. Add the dried mushrooms, stir fry for a couple of minutes and add the chicken back in the pan. Season with the cornstarch mixture, and stir. Remove from heat. 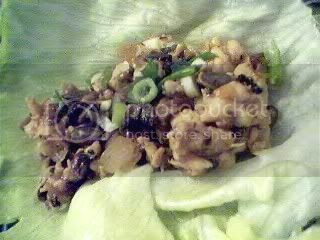 To eat, spread a little sauce on a lettuce leaf, add a spoonful of the chicken, and sprinkle with green onions. Wrap up in the lettuce, and enjoy! Hi Ting, this is also our favorite at the chinese restaurant. We were so glad when we tried making it at home and it actually came out decent. Hi Celia and Manang! Glad to be of service. I love the way we end up reminding each other what to eat next :-)ha!ha! We’ll all end up having to go on diets soon! Ooohh la la! I think I can eat this everyday. Hmmm… might try a thin layer of tamarind jam for the sauce too. Hello JMom. I finally got the time to read. Brought home some work and I finished early. We used to order this from our favorite chinese restaurant..now it’s gone bankrupt so we’re in search of a good one.